As i’m writing about this recipe, I am craving for it at the same time. 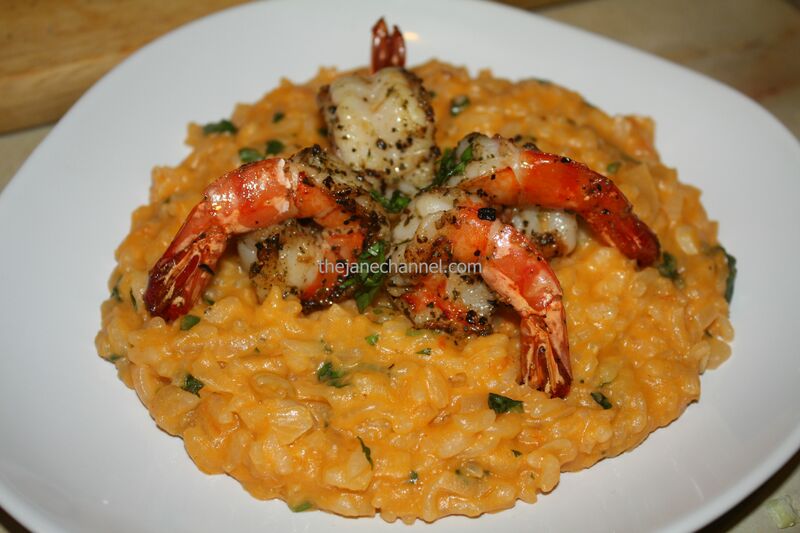 This is my favorite dish and it’s the best risotto I have ever had!! I love the shrimp creme, the fresh tomato and all the spices and cheese on it. I revised the original recipe from Food Network, so the shrimp stock portion is right for 1 cup of rice and I also marinate the shrimp for more flavors. For the shrimp cream: Heat the olive oil in a pan over medium heat and saute the shrimp until just opaque, about 2 minutes. In a food processor, puree the shrimp, heavy cream, and tomatoes until smooth. For the risotto: In a small pot bring the shrimp stock to a boil over high heat. Reduce the heat and keep warm. Heat 2 tablespoons unsalted butter in a heavy bottomed saucepan over medium heat, add the shallots and saute until soft. Add the arborio rice and onions and stir until it is coated with butter, about 1 to 2 minutes. Turn the heat to high and add the white wine, stir until most of the wine has been absorbed by the rice. Season with the salt and pepper. Add the hot stock 1/2 cup at a time, stirring constantly, after each addition, until the liquid is absorbed. Continue adding the stock and stirring to release the starch from the rice. Begin to check the rice for doneness after 18 minutes, it should be al dente. Add the shrimp cream mixture and continue to cook for 2 to 3 minutes. Remove from the heat and stir in the remaining butter, basil, parsley, and Parmesan. Adjust the seasoning. Marinate the shrimp with sea salt, garlic powder, black pepper, and paprika for 15 minutes. In a large skillet over medium heat saute the garlic and remaining shrimp in olive oil for 1 to 2 minutes. 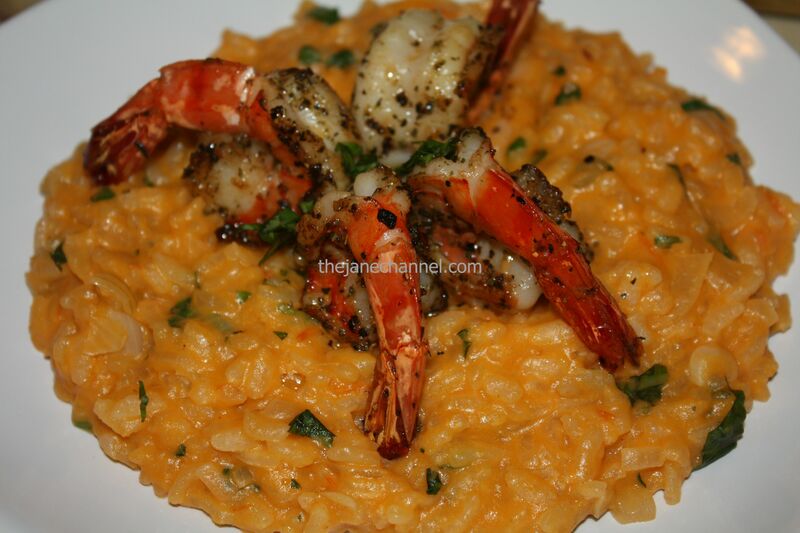 Serve the shrimp on top of the risotto and sprinkle with the parsley. In a large stock pot over high heat, saute the shrimp shells until bright pink. Add the leeks, carrots, onions, shallots, garlic, and thyme and cook until soft and golden. Pour in the white wine and reduce by half. Add the cold water and bring to a boil. Skim any foam or impurities from the surface. Simmer over medium heat for 30 minutes.